Context: Coronary artery disease (CAD) is a major cause of mortality and ill health. Objective: To assess whether 64-slice CT angiography might replace some coronary angiography (CA) for diagnosis and assessment of CAD. Data sources: Electronic databases, conference proceedings and reference lists of included studies. Study selection: Eligible studies compared 64-slice CT with a reference standard of CA in adults with suspected/known CAD, reporting sensitivity and specificity or true and false positives and negatives. Data extraction: Two reviewers independently extracted data from included studies. Results: Forty studies were included; 28 provided sufficient data for inclusion in the meta-analyses, all using a cut off point of ⩾50% stenosis to define significant CAD. In patient-based detection (n = 1286) 64-slice CT pooled sensitivity was 99% (95% credible interval (CrI) 97% to 99%), specificity 89% (95% CrI 83% to 94%), median positive predictive value (PPV) across studies 93% (range 64–100%) and negative predictive value (NPV) 100% (range 86–100%). In segment-based detection (n = 14 199) 64-slice CT pooled sensitivity was 90% (95% CrI 85% to 94%), specificity 97% (95% CrI 95% to 98%), median PPV across studies 76% (range 44–93%) and NPV 99% (range 95–100%). Conclusions: 64-Slice CT is highly sensitive for patient-based detection of CAD and has high NPV. An ability to rule out significant CAD means that it may have a role in the assessment of chest pain, particularly when the diagnosis remains uncertain despite clinical evaluation and simple non-invasive testing. Coronary artery disease (CAD) is a major cause of mortality and ill health, resulting in an estimated 7.6 million deaths globally in 2005.1 In the United Kingdom it causes around 101 000 deaths each year2 and is the most common cause of death. Currently, invasive coronary angiography (CA) is regarded as the “gold standard” for the assessment of coronary anatomy. However, conventional CA has limitations. It is an invasive procedure with a small (0.1–0.2%) risk of major complications3 and affords information only on the site and degree of luminal narrowing—providing no data on the extent of atherosclerotic change within the vessel wall. Images are obtained in only two dimensions—though the use of multiple projections enables a more comprehensive assessment of any individual lesion. Finally, there are constraints on the amount of CA that can be undertaken, in terms of the infrastructure and cardiologist time. An accurate non-invasive test for diagnosing CAD that could potentially avoid the need for some CA is, therefore, highly desirable. Multislice computed tomography (MSCT) has been developing rapidly in recent years. Four-slice machines appeared in 1998, 16-slice in 2001 and 64-slice in 2004. This has resulted in greatly increased temporal and spatial resolution4—facilitating the rapid identification and assessment of atherosclerosis within the moving coronary arteries5 6 and generating considerable interest in the concept that MSCT might potentially reduce the need for invasive CA. 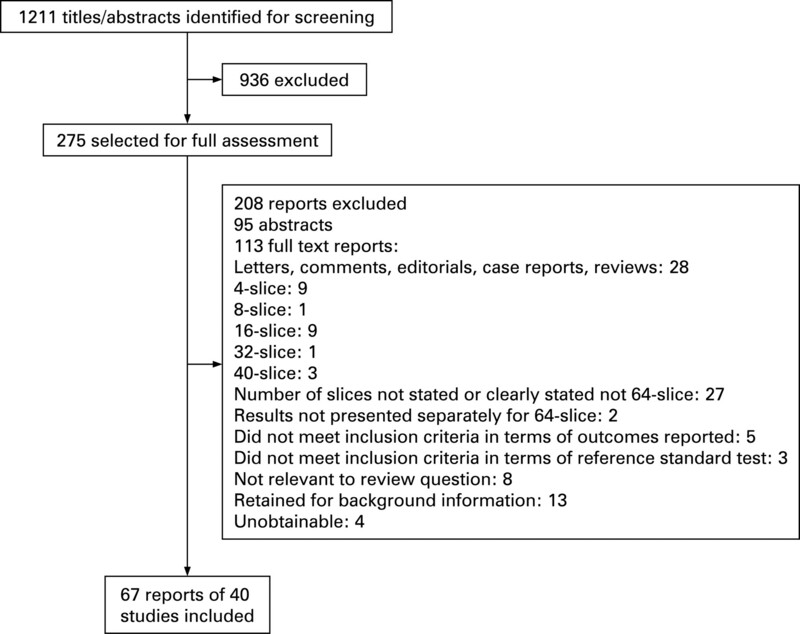 The aim of this systematic review was to assess the accuracy of 64-slice CT angiography compared with conventional CA in the diagnosis and assessment of CAD. Highly sensitive search strategies were developed using both appropriate subject headings and text word terms. Full details of the search strategies used are available from the authors. We searched the following electronic databases: Medline (2002– November week 3, 2006), Embase (2002 to December 2006), Biosis (2002 to December 2006), Science Citation Index (2002 to December 2006), Medline In-Process (14th December 2005), Cochrane Controlled Trials Register (The Cochrane Library, issue 4, 2006), Cochrane Database of Systematic Reviews (The Cochrane Library, issue 4, 2006), Database of Abstracts of Reviews of Effectiveness (December 2006), HTA Database (December 2006) and Health Management Information Consortium (2002 to May 2006). In addition, recent conference proceedings and reference lists of all included studies were scanned to identify additional potentially relevant studies. Searches were from 2002 onwards and restricted to English language reports. We included randomised controlled trials, non-randomised comparative studies or case series involving adults with suspected or known CAD. The index test was 64-slice CT angiography compared with conventional CA as the reference standard. Studies had to report sensitivity and specificity or true and false positives and negatives. One reviewer screened the titles (and abstracts if available) of all reports identified by the search strategy. Full copies of potentially relevant reports were obtained and two reviewers independently assessed them for inclusion. Data were extracted independently by two reviewers. Disagreements were resolved by consensus or arbitration by a third reviewer. Two reviewers independently assessed the methodological quality of full-text studies using QUADAS,7 which was modified to make it more applicable to studies for diagnosing and assessing CAD. Three questions in the original QUADAS tool that related to the quality of reporting rather than methodological quality were excluded (questions 2, 8 and 9). Three questions were added: (a) whether an established cut-off point was used (question 12); (b) whether data on observer variation were reported and within an acceptable range (question 13) and (c) whether data were presented for appropriate subgroups of patients (question 14). Disagreements were resolved by consensus or arbitration by a third reviewer. 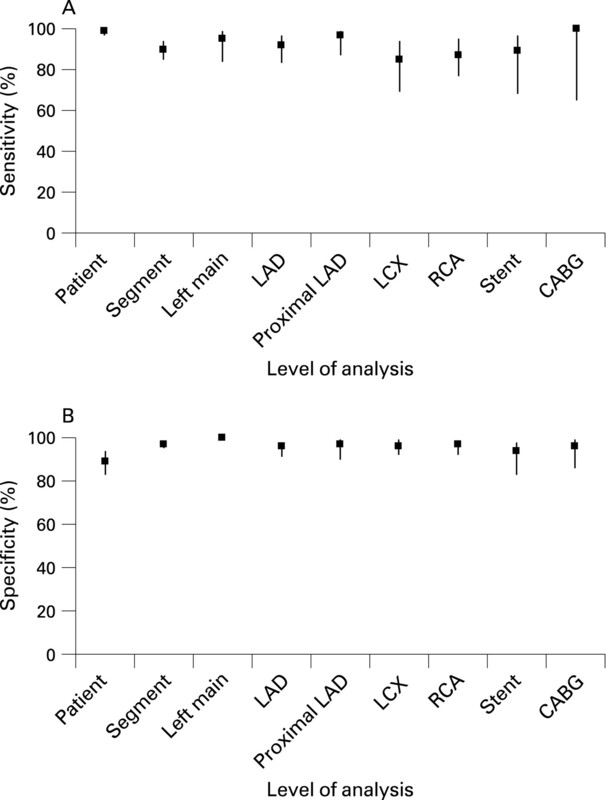 Where three or more studies reported data, summary receiver operating characteristic (SROC) curves were derived for the following levels of analysis: patient, segment, artery (left main, proximal left anterior descending (LAD), any LAD, left circumflex (LCX), right coronary artery (RCA)), stent and coronary artery bypass graft (CABG). The meta-analysis method used was the hierarchical SROC model,8 fitted using WinBUGS 1.4.9 A symmetric SROC model was used to address the lack of numerical convergence of the full SROC model. Pooled estimates for sensitivity and specificity were reported as medians and 95% credible intervals (CrIs), the Bayesian equivalent of confidence intervals (CIs). Figure 1 shows the flow of studies through the review. Out of a total of 1211 titles/abstracts screened, 275 were selected as potentially relevant and full papers obtained where possible. Forty studies (21 full text,13–33 19 abstracts34–52), published in 67 reports, met the inclusion criteria. All were non-randomised studies comparing 64-slice CT with a reference standard of invasive CA. Figure 1 Flow of studies through the review process. The characteristics of the included studies are available as supplementary table 1. The 40 studies involved more than 2400 people. In 25 studies reporting gender 67% (n = 1184) of participants were men. Across 27 studies reporting mean age this ranged from 54 to 69 years (median 61 years). Most studies reported elective assessment for CAD, with study groups including those with suspected CAD, known CAD, or both. In addition, the following specific groups were studied: patients with previous percutaneous coronary intervention or CABG and those with a suspected acute coronary syndrome. All studies used 64-slice CT angiography. Most studies (n = 28) used Siemens Sensation 64 machines; other types of equipment used included GE Healthcare Light-Speed VCT (n = 2), Philips Brilliance 64 (n = 2) and Toshiba Multi-Slice Aquilion 64 (n = 1). Figure 2 summarises the quality assessment for the 21 full-text studies. 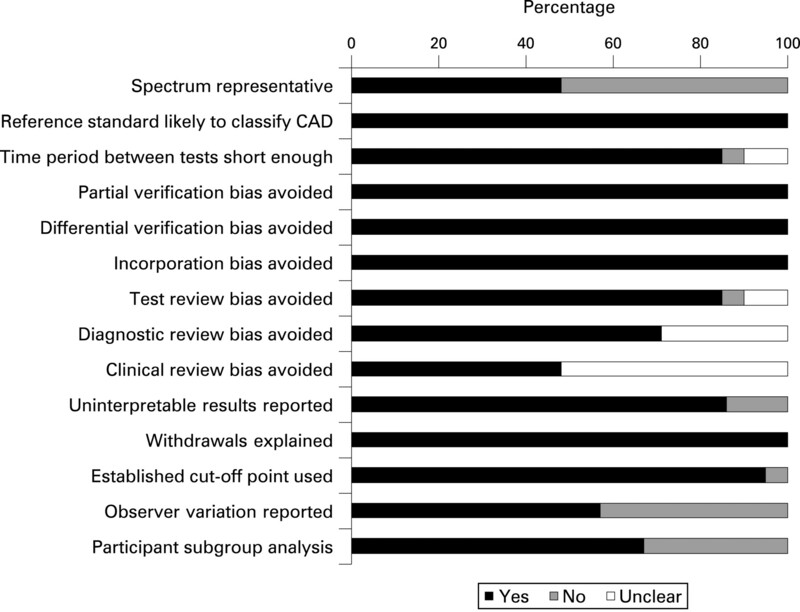 In all studies conventional CA was the reference standard, results were abstracted only if patients received both 64-slice CT angiography and the reference standard (partial verification bias avoided), patients received the same reference standard (differential verification bias avoided) and the index test did not form part of the reference standard (incorporation bias avoided). In 85% of studies those interpreting 64-slice CT data were blinded to the results of the reference standard test (test review bias avoided) and in 71% of studies vice versa (diagnostic review bias avoided). In 48% of studies the participants belonged to specific groups (spectrum bias)—for example, those with previous revascularisation. Figure 2 Results of the quality assessment of the 21 full-text studies. The question on “partial verification bias avoided” was checked “Yes” for two studies[16, 17] in which only some patients received both index and reference standard tests. For these two studies only the results for the patients who received both tests were included in the review. CAD, coronary artery disease. Twenty-eight studies provided sufficient data (true positives, false positives, false negatives, true negatives) to allow their inclusion in the meta-analyses, although the number of studies included for each level of analysis varied (table 1). Figure 3 shows the pooled estimates for the sensitivity and specificity of 64-slice CT angiography for detecting significant CAD for each level of analysis (also available in supplementary table 2). Across studies the median positive predictive value (PPV) and negative predictive value (NPV) along with their ranges for each level of analysis are shown in fig 4 (also available in supplementary table 2). All studies used a cut-off point of >50% or ⩾50% stenosis to define significant CAD. Figure 3 Pooled estimates (95% credible interval) for different levels of analysis. Left main artery: owing to numerical difficulties with the hierarchical summary receiver operating characteristic symmetric model, sensitivity and specificity were pooled using the weighted average method and confidence intervals rather than credible intervals were reported. CABG, coronary artery bypass graft; LAD, left anterior descending; LCX, left circumflex; RCA, right coronary artery. Figure 4 Median (A) positive and (B) negative predictive values (PPV and NPV) across studies (range). CABG, coronary artery bypass graft; LAD, left anterior descending; LCX, left circumflex; RCA, right coronary artery. In 18 studies (n = 1286) 64-slice CT was extremely sensitive in patient-based detection of CAD, with a pooled sensitivity of 99% (95% CrI 97% to 99%). Specificity was lower at 89% (95% CrI 83% to 94%). The median NPV across studies was very high at 100% (range 86–100%), while PPV was 93% (range 64–100%). The wide range of PPVs is probably due to the studies being heterogeneous in terms of their populations and the prevalence of significant CAD (median across studies 58%, range 23–96%). The median false positive rate across studies was 10% (range 0–50%), representing an overestimation of the presence of non-significant stenosis as significant, as opposed to finding CAD where none existed. There was very low statistical heterogeneity for sensitivity (I2 = 0.1%) and moderate statistical heterogeneity for specificity (I2 = 31.7%). In 17 studies reporting coronary artery segment-based detection (n = 14 199), compared with patient-based detection, pooled sensitivity was lower (90%, 95% CrI 85% to 94%), specificity higher (97%, 95% CrI 95% to 98%), median PPV lower (76%, range 44–93%) and NPV similar (99%, range 95–100%). Five of 18 studies in the pooled estimates for patient-based detection of CAD, and three of 17 for segment-based detection, were abstracts. A sensitivity analysis undertaken to examine the effect of removing abstracts from the pooled estimates found that this did not affect the results. For patient-based detection sensitivity remained unchanged at 99% (95% CrI 97% to 99%), while specificity increased slightly to 91% (95% CrI 84% to 95%). For segment-based detection sensitivity also remained unchanged at 90% (95% CrI 84% to 94%), while specificity decreased slightly to 96% (95% CrI 94% to 98%). At artery level pooled sensitivity and specificity were both highest for the left main artery (95% (95% CI 84% to 99%); 100% (95% CI 99% to 100%), respectively). Pooled sensitivity was lowest for the LCX at 85% (95% CrI 69% to 94%). Pooled specificity estimates for all of the arteries were very high at ⩾96%. Across studies the median PPV and NPV were also both highest for the left main artery (100%, range 90–100%; 100% (all five studies) respectively). 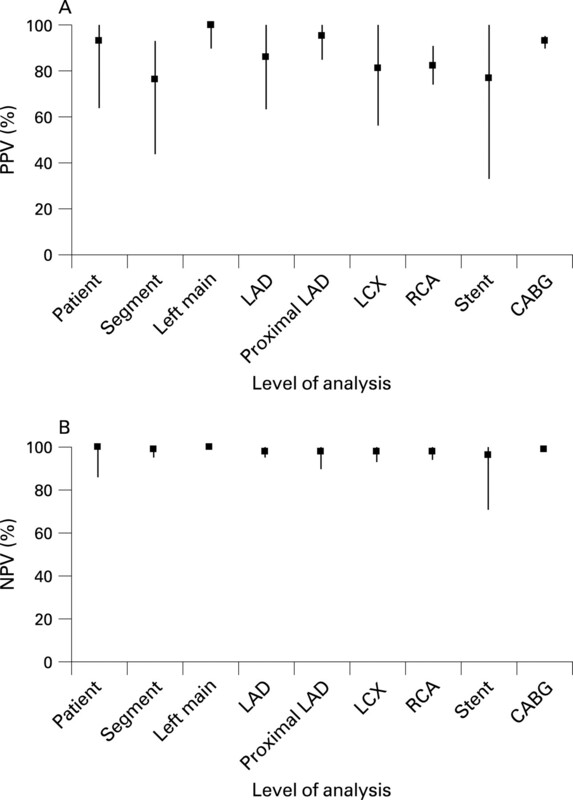 The median NPVs for all of the arteries were very high at ⩾98% (ranges: LAD 95–100%; LCX 93–100%; RCA 94–100%). The median PPV was lowest for the LCX (81%, range 56–100%). In six studies reporting patency of stents (n = 317), with a cut-off point >50% or ⩾50% in-stent restenosis defining a positive test result, sensitivity was 89% (95% CrI 68% to 97%) and specificity 94% (95% CrI 83% to 98%), while across studies the median PPV was 77% (range 33–100%) and NPV was 96% (range 71–100%). Stents caused some problems for 64-slice CT. Leber and colleague reported that of nine stents without any restenosis on conventional CA four were false positives on 64-slice CT due to artefacts caused by the dense stent material.18 Importantly, the utility of CT angiography appears to be greatly influenced by the diameter and strut thickness of the stent.29 In three studies 21% (59/276) of stents were classed as unevaluable and excluded from analysis,28 29 36 while the remaining three studies did not report this information. Four studies reported patency of bypass grafts (n = 543). Both sensitivity and specificity were very high (99%, 95% CrI 95% to 100%; 96%, 95% CrI 86% to 99%, respectively), while across studies the median PPV was 93% (range 90–95%) and NPV was very high at 99% (range 98–100%). Only three studies assessed the diagnostic performance of 64-slice CT in patients admitted to hospital with suspected acute coronary syndromes (n = 232).16 35 46 Across these studies the median (range) values were 100% (97–100%) for sensitivity, 100% (79–100%) for specificity, 100% (87–100%) for PPV and 100% (94–100%) for NPV. Scans could not be adequately evaluated in 2% (11/718) of patients (n = 13 studies), 8% (997/12 476) of all arterial segments, 21% (59/276) of stented segments (n = 3 studies) and 0% (0/231) of bypass grafts (n = 2 studies). Three per cent (11/404) of scans of the left main artery, 5% (74/1641) of the RCA and 6% of both the LAD (104/1789) and the LCX (93/1444) could not be evaluated. Studies reported that poor image quality was caused by factors including irregular heart rhythm, sinus tachycardia >90/min, calcification, vessel motion or small vessel calibre in distal segments. It is unclear to what extent the exclusion or otherwise of small diameter vessels affected 64-slice CT performance as only seven studies provided this information, with five excluding segments <1.5 mm in diameter from analysis19 23 25 30 31 and two analysing all vessels regardless of size.20 27 Across the five studies excluding segments <1.5 mm the median sensitivity was 87% (range 85–94%) and specificity 96% (range 76–97%) compared with median sensitivity of 90% (range 86–94%) and specificity of 96.5% (range 95–98%) for the two studies analysing all segments. This study suggests that 64-slice CT angiography is highly sensitive for patient-based detection of significant CAD (⩾50% stenosis), with a very high NPV. This high NPV was also apparent in analyses based on individual coronary arteries and segments. At artery level the best results for 64-slice CT were in those arteries such as the left main and LAD arteries where significant CAD carries the poorest prognosis. Based on a few small studies, broadly similar results were demonstrated in patients who had undergone prior coronary artery stenting, CABG and those with a suspected acute coronary syndrome. Although CT is regarded as non-invasive, it delivers a higher radiation dose than conventional CA and concerns have been raised about indiscriminate or repetitive use and, in particular, the risks in younger people or women of childbearing age.56 Hausleiter and colleagues57 reported an effective mean (SD) radiation dose of 11.0 (4.1) mSv for 64-slice CT. By comparison estimates of mean effective doses for conventional CA include <5 mSv by a British Cardiovascular Society Working Group,58 and 4–8 mSv by the Technology Evaluation Center.59 In this review six studies15–18 22 28 reported a 64-slice CT radiation dose for the patient population as a whole and six20 21 26 27 30 31 reported it separately for men and women. The radiation dose for men ranged from 7.5 mSv30 to 15.2 mSv20 21 and for women from 10.2 mSv31 to 21.4 mSv.20 21 Two30 31 of these studies, using ECG-controlled dose modulation to reduce the tube current during systole, reported the lowest radiation doses: 7.5 mSv30 and 8.6 mSv31 for men and 10.2 mSv30 and 12.2 mSv31 for women. One study19 used an alternative technique, automatic exposure control,60 to reduce radiation dose exposure but did not report the actual dosage values that the patients received. With the development of more modern technologies and methods, it may be possible to reduce the radiation dose further. Einstein and colleagues61 have estimated that a single 64-slice CT scan would result in an increase in lung cancer and breast cancer risk, especially if used in younger patients (for example, an estimated lifetime attributable cancer risk of up to 1 in 114 after a combined heart and aortic scan in a 20-year-old woman, compared with 1 in 715 for a 60-year-old woman after a heart scan using ECG-controlled dose modulation). The current review included both full-text studies and conference abstracts in an attempt to obtain the latest available data. All studies used the same reference standard of conventional CA and only data for those who received both index test and reference standard were included in the meta-analyses. A limitation was that non-English language studies were excluded. No adjustment was made for studies which used multiple samples from each participant for some levels of analysis. Given the high sensitivity and NPV, the main role of MSCT may be to rule out significant CAD, and thereby reduce the need for invasive CA. There are several clinical situations where this may be particularly useful. In patients with a very low probability of CAD it is unlikely that MSCT would be recommended, particularly given the radiation doses involved. Likewise, when the probability of CAD is high conventional angiography is likely to remain the preferred investigation in most patients. However, very many patients fall into an intermediate category where the diagnosis of CAD remains uncertain after clinical assessment and simple non-invasive testing. Currently, this may necessitate either myocardial perfusion scanning or invasive CA. It seems likely that MSCT may have an increasing role in this setting. Although further work is required to determine the prognostic utility of MSCT and to clarify its precise clinical role, the currently available data suggest that it will play an increasing role in the evaluation of patients with known or suspected CAD. The technology continues to evolve and data are awaited on the marginal costs and benefits of the next generation of MSCT, the 256 and higher-slice CT machines. NW designed the study. CF developed the search strategies, obtained papers and formatted the references. GM screened the search results. GM and XJ undertook data extraction and quality assessment. JAC and GM analysed and interpreted data. GM drafted the manuscript. GH, SW and NW provided expert advice. All authors commented on drafts and approved the final manuscript. GM is guarantor.
. Cardiovascular diseases. Fact sheet No 317. Geneva: World Health Organization, 2007. Available at http://www.who.int/mediacentre/factsheets/fs317/en/index.html (accessed 19 July 2008).
. British Heart Foundation Statistics. Numbers dying from CVD and CHD. London: British Heart Foundation, 2007. http://www.heartstats.org/datapage.asp?id = 713 (accessed 19 July 2008).
. Coronary angiogram [webpage on the Internet]. London: British Heart Foundation 2007. Available at http://www.bhf.org.uk/living_with_heart_conditions/diagnosis/coronary_angiogram.aspx (accessed May 2008).
. Assessment of coronary artery disease by cardiac computed tomography: a scientific statement from the American Heart Association Committee on Cardiovascular Imaging and Intervention, Council on Cardiovascular Radiology and Intervention, and Committee on Cardiac Imaging, Council on Clinical Cardiology. Circulation 2006;114:1761–91.
. Multidetector computed tomography for the diagnosis of coronary artery disease: a systematic review. Am J Med 2006;119:203–16.
. Contrast-enhanced cardiac computed tomographic angiography in the diagnosis of coronary artery stenosis or for evaluation of acute chest pain. TEC Asssesment 2006;21.
. The development of QUADAS: a tool for the quality assessment of studies of diagnostic accuracy included in systematic reviews. BMC Med Res Methodol 2003;3:25. Available at http://www.biomedcentral.com (accessed May 2008).
. A hierarchical regression approach to meta-analysis of diagnostic test accuracy evaluations. Stat Med 2001;20:2865–84.
. WinBUGS: Bayesian inference using Gibbs sampling. User manual, version 1.4. Cambridge: MRC Biostatistics Unit, 2003.
. Systematic reviews in health care: systematic reviews of evaluations of diagnostic and screening tests. BMJ 2001;323:157–62.
. Meta-DiSc for Windows: a software package for the meta-analysis of diagnostic tests. Barcelona: XI Cochrane Colloquium, 2003. Available at http:/www.hrc.es/investigacion/metadisc_en.htm (accessed 20 July 2008). , eds. Glossary. Cochrane Handbook for Systematic Reviews of Interventions 4.2.5. Available at http://www.cochrane.org/resources/handbook (accessed 20 July 2008).
. Diagnostic accuracy of 64-slice computed tomography for detecting angiographically significant coronary artery stenosis in an unselected consecutive patient population: comparison with conventional invasive angiography. Circ J 2006;70:564–71.
. Comparison of accuracy of 64-slice cardiovascular computed tomography with coronary angiography in patients with suspected coronary artery disease. Am J Cardiol 2006;97:173–4.
. Non-invasive detection of coronary artery disease in patients with left bundle branch block using 64-slice computed tomography. J Am Coll Cardiol 2006;48:1929–34.
. Coronary multidetector computed tomography in the assessment of patients with acute chest pain. Circulation 2006;114:2251–60.
. ECG-gated 64-MDCT angiography in the differential diagnosis of acute chest pain. AJR Am J Roentgenol 2007;188:76–82.
. Quantification of obstructive and nonobstructive coronary lesions by 64-slice computed tomography: a comparative study with quantitative coronary angiography and intravascular ultrasound. J Am Coll Cardiol 2005;46:147–54.
. Accuracy of MSCT coronary angiography with 64-slice technology: first experience. Eur Heart J 2005;26:1482–7.
. Pre-operative computed tomography coronary angiography to detect significant coronary artery disease in patients referred for cardiac valve surgery. J Am Coll Cardiol 2006;48:1658–65.
. High-resolution spiral computed tomography coronary angiography in patients referred for diagnostic conventional coronary angiography. Circulation 2005;112:2318–23.
. Accuracy of 64-MDCT in the diagnosis of ischemic heart disease. AJR Am J Roentgenol 2006;187:111–7.
. Accuracy of 64-row multidetector computed tomography in detecting coronary artery disease in 134 symptomatic patients: influence of calcification. Am Heart J 2006;151:1323.e1–6.
. Initial experience with 64-slice cardiac CT: non-invasive visualization of coronary artery bypass grafts. Eur Heart J 2006;27:976–80.
. Coronary artery imaging with 64-slice computed tomography from cardiac surgical perspective. Eur J Cardiothorac Surg 2006;30:109–16.
. Diagnostic accuracy of non-invasive 64-slice CT coronary angiography in patients with stable angina pectoris. Eur Radiol 2006;16:575–82.
. Diagnostic accuracy of noninvasive coronary angiography using 64-slice spiral computed tomography. J Am Coll Cardiol 2005;46:552–7.
. Assessment of coronary artery stent patency and restenosis using 64-slice computed tomography. Acad Radiol 2006;13:1465–73.
. Assessment of coronary artery stent restenosis by 64-slice multi-detector computed tomography. Eur Heart J 2006;27:2567–72.
. Usefulness of multidetector row spiral computed tomography with 64- ×0.6-mm collimation and 330-ms rotation for the noninvasive detection of significant coronary artery stenoses. Am J Cardiol 2006;97:343–8.
. Diagnostic accuracy of noninvasive coronary angiography in patients after bypass surgery using 64-slice spiral computed tomography with 330-ms gantry rotation. Circulation 2006;114:2334–41.
. Diagnostic accuracy of 64-slice multislice computed tomography in the noninvasive evaluation of significant coronary artery disease. Am J Cardiol 2006;98:145–8.
. Usefulness of coronary computed tomographic angiography to assess suitability for revascularization in patients with significant coronary artery disease and angina pectoris. Am J Cardiol 2006;98:1198–201.
. Diagnostic accuracy of 64-slice spiral computed tomography in the detection of significant coronary artery stenoses and delayed myocardial enhancement in consecutive patients [abstract]. Int J Cardiovasc Imag 2006;21:701.
. Non invasive assessment of coronary artery disease by multislice computed tomography in patients with acute chest pain. World Congress of Cardiology, Barcelona, September 2006:abstr P1717.
. Diagnostic accuracy of coronary in-stent restenosis using 64-slice computed tomography: comparison with invasive coronary angiography. World Congress of Cardiology, Barcelona, September 2006:abstr P888.
. Accuracy and usefulness of 64-slice spiral computed tomography for assessing the prevalence, quantification and morphology of coronary athersclerosis in patients with type 2 diabetes and the metabolic syndrome: preliminary results in comparison with catheter angiography [abstract]. Int J Cardiovasc Imag 2006;21:704.
. Improved visualization of coronary artery bypass grafts and their run-off vessels by 64-slice CT angiography. American Heart Association Annual Scientific Sessions, Dallas, Texas, November 2005:abstr 2656.
. Diagnostic accuracy of 64-slice CT imaging for the identification of coronary artery stenoses [abstract]. Int J Cardiovasc Imag 2006;21:680.
. 64-slice CT imaging in post-coronary artery bypass patients [abstract]. Int J Cardiovasc Imag 2006;21:706.
. Diagnostic performance of 64-slice CT in symptomatic patients with previous coronary bypass surgery evaluation of grafts and coronary arteries. World Congress of Cardiology, Barcelona, September 2006:abstr P1716.
. Non-invasive evaluation of coronary artery stent patency and in-stent restenosis with 64-slice CT coronary angiography: comparison with conventional angiography. World Congress of Cardiology, Barcelona, September 2006: abstr P 880.
. Comparison of predictive value between 16-slice and 64-slice multidetector computed tomography to detect significant obstructive coronary artery disease [abstract]. J Am Coll Cardiol 2006;47:130A.
. Comparison of 4, 16, and 64 row multi-slice computed tomography to evaluate in stent restonosis and MLD. World Congress of Cardiology, Barcelona, September 2006: abstr P905.
. Noninvasive coronary angiography performed with 4-slice, 12-slice, 16-slice and 64-slice CT: comparison of diagnostic accuracy [abstract]. J Am Coll Cardiol 2006;47:130A.
. 64-Slice CT coronary angiography in patients with acute coronary syndromes: first experience. European Congress on Radiology, Vienna, March 2006:abstr B-707.
. Usefulness of 64-slice multi detector computed tomography to improve diagnostic yield in patients with chest pain and negative or equivocal exercise treadmill tests [abstract]. J Am Coll Cardiol 2006;47:114A.
. 64-Slice multidetector cardiac CT findings in patients with low grade reversible perfusion defects on single-photon emission computed tomography. World Congress of Cardiology, Barcelona, September 2006:abstr P2493.
. 64-Slice CT angiography reliably detects and excludes significant coronary artery stenosis on a per-patient but not a per-vessel or per-segment basis. European Congress on Radiology, Vienna, March 2006:abstr B-709.
. Non-invasive coronary angiography using 64-detector row computed tomography. European Congress on Radiology, Vienna, March 2006:abstr B-708.
. Multidetector-row computed tomography diagnostic accuracy in the real world of cardiology: a comparison with invasive coronary angiography. World Congress of Cardiology, Barcelona, September 2006:abstr P2494.
. Comparison of coronary angiography between 64-slice and 16-slice spiral CT. Acta Academiae Medicinae Sinicae 2006;28:26–31.
. Diagnostic performance of multislice spiral computed tomography of coronary arteries as compared with conventional invasive coronary angiography: a meta-analysis. J Am Coll Cardiol 2006;48:1896–910.
. Noninvasive imaging for coronary artery disease: a technology assessment for the Medicare Coverage Advisory Commission. Am Heart J 2007;153:161–74.
. Diagnostic value of multislice computed tomography angiography in coronary artery disease: a meta-analysis. Eur J Radiol 2006;60:279–86.
. Noninvasive coronary angiography: hype or new paradigm? JAMA 2005;293:2531–3.
. Radiation dose estimates from cardiac multislice computed tomography in daily practice: impact of different scanning protocols on effective dose estimates. Circulation 2006;113:1305–10.
. Role of non-invasive imaging in the management of coronary artery disease: an assessment of likely change over the next 10 years. A report from the British Cardiovascular Society Working Group. Heart 2007;93:423–31.
. Contrast-enhanced cardiac computed tomographic angiography for coronary artery evaluation. TEC Assessment 2005;20.
. Use of automatic exposure control in multislice computed tomography of the coronaries: comparison of 16-slice and 64-slice scanner data with conventional coronary angiography. Heart 2007;93:1040–3.
. Detection of non-ST-elevation myocardial infarction and unstable angina in the acute setting: meta-analysis of diagnostic performance of multi-detector computed tomographic angiography. BMC Cardiovasc Disord 2007;7:39. Available at http://www.biomedcentral.com (accessed May 2008).
. Clinical value of multidetector CT coronary angiography as a preoperative screening test before non-coronary cardiac surgery. Heart 2007;93:1591–8. Funding: This paper was developed from a Health Technology Assessment of the clinical and cost-effectiveness of 64-slice or higher computed tomography angiography as an alternative to invasive coronary angiography in the investigation of coronary artery disease, which was funded by the UK National Institute for Health Research Health Technology Assessment programme (project number 06/15/01). The Health Services Research Unit is core funded by the Chief Scientist Office of the Scottish Government Health Directorates.